Unparalleled Parking | Arts and Culture | Style Weekly - Richmond, VA local news, arts, and events. Search for the kinder, gentler, downtown parking deck. 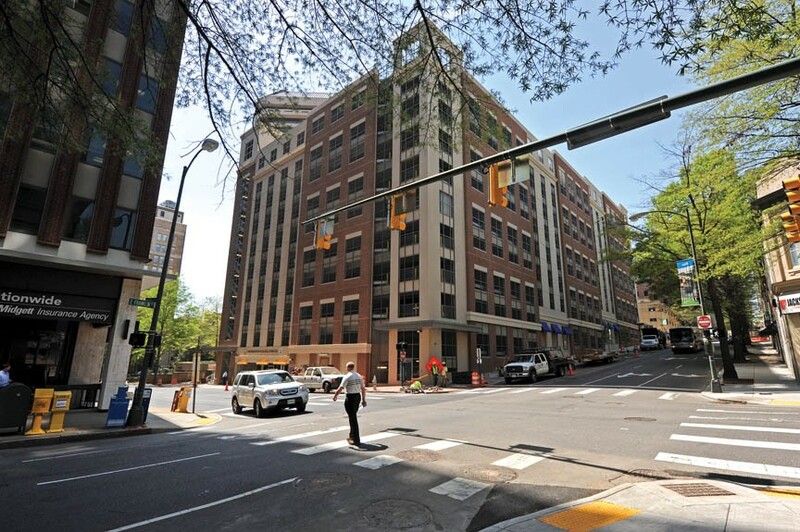 The state's new parking deck, bounded by Franklin, Sixth and Seventh streets, is that rare example of an unfortunate urban necessity — the car park — blending in nicely with the surroundings. For generations, and even with rising gas prices, Americans have maintained their love affair with the automobile. Parking garages, not so much. It's understandable. While most cars don't vary all that much in size, turning radiuses or what's required to operate them, no architect or engineer has established a universal standard for parking decks — say, the angle of ramps and decks or where to place the stairways. Therefore, since we haven't a clue what to expect when we enter a garage for the first time, the experience can trigger slight trepidation. Decades ago, among the reasons many shoppers enjoyed the downtown department stores was the convenience of a deck on East Grace Street that offered valet parking. The half block where that structure once stood is now a surface parking lot, but one block immediately to the south, in the 600 block of East Franklin Street, downtown's newest parking garage has recently been built by the Commonwealth of Virginia, apparently for state workers only. So while I haven't experienced the interior logistics of this massive 357,000-square-foot structure — it accommodates 1,000 cars — the deck's completion is a reminder that downtown may now have more parking structures than any other building type. Generally, parking decks fall into either of two design categories. First are the straightforwardly brutalistic structures that possess an industrial aesthetic. At mid-20th century, many such decks were backstreet propositions built on the fringes of the principal downtown thoroughfares — Marshall Street decks served buildings on Broad, and Cary Street garages supported Main Street's financial district. But those lines have blurred since Broad is no longer a retail destination and, in a sea change that few have noticed, many of Main Street's financial institutions have recently moved to office complexes near the river. These muscular concrete and steel garages — part of a tradition that dates back to the advent of modernism — possess architectural honesty, if an unforgiving quality. But they do establish walls, and therefore deliver more urbanity along the sidewalk than is possible with surface lots. A second approach to garage design grew out of architectural postmodernism in the 1970s and '80s. These decks had decoration or historical context and often were built adjacent to high-visibility landmarks. Examples of contextual decks can be found on North Fifth Street, where a Gothic Revival-tinged structure was built to complement Second Presbyterian Church and a classically inspired deck on West Franklin that blends with Congregation Beth Ahabah and St. James's Episcopal Church across the street. These faux historical structures offer up a kindler and gentler parking deck. The state's tidy new deck (bounded by Franklin, Sixth and Seventh streets and the 700 Centre office tower) is the latter breed. Commonwealth Architects and the design-build operation of S.B. Ballard Construction Co. have delivered an anxious-to-please structure that makes grand gestures toward acknowledging human scale on this sprawling, six-level deck. Vehicles enter and exit off of Sixth and Seventh streets so Franklin Street, one of the city's historic east-west thoroughfares, has neither a gaping hole in its front wall nor the danger of cars careening downhill on the one-way street when the traffic light changes. Secondly, the designers broke up the mass of the facade by establishing six bays along Franklin. These are defined by alternating vertical bands of cast concrete and brick siding and suggest six separate buildings. Finally, there are large window openings that establish horizon lines, but through the open spaces one can easily see the sloping decks inside. It's clearly a parking garage. But the structure tries too hard at the pedestrian level where three blue canvas awnings are applied midblock near the first floor but overhang and shield nothing. They're cloying and can be read as too apologetic. The stairwells and elevators are at the outer corners of the building and these entrances and exits are announced by metal canopies that jut over the sidewalks. Where things get most interesting is at rear of the garage which fronts the terraced and well-planted pedestrian plaza of the Main Street Centre. On this side the architect continues the same outer wall treatment as on the three street fronts. Rarely does the inner block treatment get equal play. It's strange, but not bad. In fact, the garage serves to frame, both tightly and attractively, this adjacent pedestrian plaza that was unanchored before the establishment of the new architectural backdrop. And from the Main Street sidewalk, this low-key structure also serves to set off fancier buildings nearby such as the former Virginia Electric and Power Co. high-rise at Seventh and Franklin.